Carette, E., Thiébaut, E., & Nassau, G. (2015). The dynamics of emotional relationships in self-directed language learning counselling. Studies in Self-Access Learning Journal, 6(1), 50-61. This study seeks to identify the dynamics of emotional relationships during counselling interviews in self-directed language learning. Counsellors’ and learners’ emotional states are inferred from tone of voice following analysis of audio recordings of their exchanges. Emotions expressed in every turn are characterized on valence and activation scales, and emotional relationships synthesized in a typology. Most of the observed emotional fluctuations are learner-initiated, and results suggest that counsellors regulate emotions in order to maintain an emotional climate, which is argued to favour self-directed learning tasks. In language teaching situations, both learners and teachers engage in emotional experiences. Interactions between them seem to affect learning (Pekrun, Goetz, Titz, & Perry, 2002), especially because emotions can impact motivation, which can explain commitment and perseverance in action (Frijda, 2003). Teaching characteristics and teachers’ emotional expressions can affect learners through a mechanism called “emotional contagion” (Hatfield, Cacioppo, & Rapson, 1994). The positive emotions and intrinsic motivation expressed by a teacher can be correlated with learners’ testimonies of positive emotions and motivation to learn (Bieg, Backes, & Mittag, 2011; Meyer & Turner, 2006). Emotions in language learning have long been of interest for researchers, who suggest they have an influence on the learning outcomes (Dewaele, 2010). Such studies commonly look at relationships with many psychological functions and personal characteristics, such as attention (Carretié, 2014), motivation and goal setting (Plemmons & Weiss, 2013), resource allocation (Frijda, 2004), personality (Ehrman, 2008), imagination (MacIntyre & Gregersen, 2012), or learning styles (Bailey, Daley, & Onwuegbuzie, 1999). This study is situated in the specific context of EFL self-directed learning  in a private language resource centre. The learner training has two main goals: developing proficiency in English and developing learning ability. This is part of a programme designed to empower learners (Carette, Guély, & Pereiro, 2011), with one of its main features consisting of counselling sessions. Lasting from thirty minutes to one hour, these one-to-one discussions are subject to social constraints such as politeness, and the social roles encourage counsellors to foster trust: they do so by making learners feel comfortable, motivating them, and avoiding anxiety-provoking situations. Studies on the emotions expressed in this kind of interview are rare, and the scope of emotional expression in this context is still ignored in foreign language teaching/learning research. A great variety of emotions are involved during learner-counsellor interactions and change. During the first one-to-one discussion, emotions can be linked to the novelty of the learning paradigm, to the one-to-one situation, or to requests for personal involvement that can be experienced as anxiogenic, or exciting, by the learner. The study follows a concept according to which emotional relations between learner and counsellor contribute both to the positive evaluation of events occurring during counselling interviews and to explaining in part the learner’s commitment and perseverance. Events occurring in the course of these interviews can be imagined as problem-solving situations requiring a change of perspective, such that it can lead to the learner re-evaluating his or her own competence, to achieving a better understanding of the processes involved in learning, or to a better appropriation of learning practice. Emotions attached to such events can influence a learner’s decision-making regarding language learning. This could partly be the result of the counsellor’s regulating influence. With a view to shedding some light on the mechanisms and the processes that might explain the link between emotional relations in counselling interviews and the results of learning, an intermediate step is needed to describe the organization of emotional relations. The study seeks to determine whether patterns of emotional relations can be found in learner-counsellor interaction, and if so, which? If such patterns exist, the results of the study might contribute to explaining how emotional regulation functions. Future research developments might aim at examining the links between patterns of emotional relations and the learning outcomes, and practical developments might aim at constructing material to be used in counsellor training to introduce them to this psychological aspect of their profession. The study looks at “emotions”, which are actually one aspect of several phenomena commonly included under this umbrella label. The literature generally considers emotion as an adaptive multi-component phenomenon covering expressive, physiologic, behavioural, evaluative and subjective experience components. According to appraisal theory (Lazarus, 1991; Scherer, Shorr, & Johnstone, 2001), emotions stem from a cognitive appraisal of situations, which subsequently determine future action potentials. The expressive component provides a signal to the social environment about the person’s subjective representation of the situation and intended action. Emotions may then be regarded as an action-planning system; Frijda (2003), for example, conceives of them as motivational states, which “push the individual to change his relationship with an object, a state of the world, or a state of self, or to maintain an existing relationship despite obstacles or interferences” (p. 16). This notion might help to make sense of the interplay between emotional relationships in learner-counsellor interactions, making it possible to look at the emotional relationships between the two actors other than as the result of emotional contagion. The primary data for this study derive from audio-recorded and transcribed counselling sessions. These sessions were recorded in a private language centre. Learners would come to the centre to work on a platform specifically designed for self-directed EFL learning. They would meet their counsellor for the first time before beginning to work on their English, and then twice a month to discuss their work, choices and progress. The sessions were all conducted in French, because the purpose was to think about their learning (Holec, 1990), not to practice speaking English. The data consist of two series of five interviews between adult counsellors and learners: the first series is composed of three interviews between a female 30-35 year-old counsellor (C1) and a male 45-50 year-old learner (A1), and two interviews between this male learner and another female 30-35 year-old counsellor (C2). The second series includes five interviews between C2 and a male 35-40 year-old learner (A2). The whole body of research is five hours ten minutes long and includes 6,200 turns. Learners and counsellors agreed to be recorded. Two of the authors worked as counsellors in the resource centre, but did not participate in the sessions recorded here. In their experience, learners and counsellors rapidly forget about being recorded and act naturally. In this study, emotional states of learners and counsellors were inferred from their vocal expression, since many empirical studies have demonstrated that people are most often capable of properly inferring affective states or attitudes from others on the basis of voice indices (Martin, 2014; for a review, see Scherer, 1989; Scherer, Banse, & Wallbott, 2001). Other types of measurements (as for instance, the Facial Action Coding System (Ekman & Friesen, 1978)) were excluded because counsellors and learners were most often jointly looking at the computer screen. This layout led them to mainly communicate through the auditory canal. On the practical level, every turn (learner, counsellor) is listened to and evaluated along two dimensions capable of representing any emotional state. These are based on Russell’s (1980) initial model with its two dimensions of valence (pleasant vs. unpleasant aspects of emotion) and activation (intensity). Using a seven-point scale, two raters independently assessed the degree of activation of the perceived emotional tone for each turn, and the degree of valence. 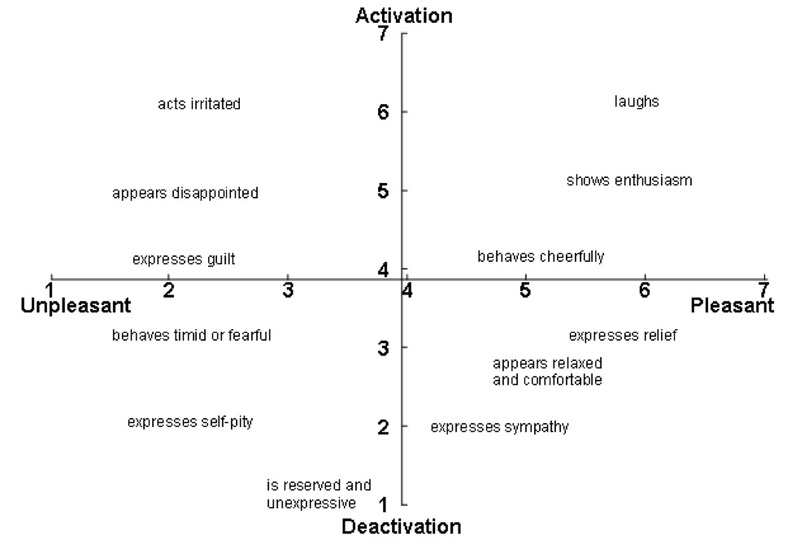 The position of a few emotional expressions on the seven-point scale is illustrated in Figure 1 below. The raters familiarised themselves with the scale by working together several times. Once the scale was judged as convenient enough (i.e. precise enough, and allowing neutral emotions through an uneven number of points for valence), ratings were continued individually. The reliability of the mean score on the valence and activation dimensions based on the two raters’ evaluations was tested by internal consistency (Cronbach, 1951). The value of the coefficient is .81 for valence and .71 for activation, which appears to be satisfactory, given that emotions are weakly expressed in social face-to-face settings with people who do not know each other. When relationships between the learner’s emotions and those of the counsellor were analysed in more than three thousand pairs of turns, positive correlations appeared, but were of low intensity (.22 for valence, .31 for activation). Emotion changes seem to be synchronous; this may be attributed to the influence of a learner’s emotions on the counsellor’s emotions, following a single pattern, which may be interpreted in terms of contagion. However, an in-depth examination of valence and activation in every pair of turns suggests substantial disparities. The general information expressed in terms of correlation does not seem to be representative of the various cases. Therefore, general data processing was inadequate to address the variety of cases found. An analysis of smaller units was necessary to investigate the nature of learner-counsellor emotional relationships. In order to obtain information that better represents an emotional relationship, the first step was to identify and classify similar pairs of turns. Ratings were used to create valence and activation scores for each pair of turns (learner at a moment in time t0, then counsellor at t1). The difference or similarity between the scores was used to define a relationship profile. More than 3,100 pairs of turns from the whole data set were classified according to the degree of parallelism between profiles. Similarity between profiles is represented by a correlation coefficient calculated from valence and activation. The structure of similarities between profiles was examined using hierarchical cluster analysis (Ward’s method; see Everit, 1977). The automatic classification procedure was applied to pairs of turns (learner at t0, then counsellor at t1). In the second step, the emotion expressed by the learner at t2 was linked to the first classification, in order to observe whether learners react differently according to the emotional profile clusters. Because the hierarchical cluster analysis is descriptive and exploratory, the number of clusters (learner t0 and counsellor t1) necessary and sufficient to describe the data was not based on theoretical preconceptions. A five-cluster solution was deemed sufficient to account for nearly all the cases present in the data. The level of granularity was calculated so that, on the one hand, it covered almost all the cases present in the data, but on the other was sufficiently fine-tuned that each category contained only similar items (convergence between the average profile in a class and the individual cases within that class). Inter-class differences were statistically significant, as shown by an analysis of variance of the emotional scores (valence: F(4, 3040) = 359.99, p = < .001; activation: F(4, 3040) = 199.83, p = < .001). ), which means that every cluster reflects an emotional relationship which is clearly distinguishable from that of another cluster. Once the initial t0-t1 paired classification had been determined, t2 was taken into consideration. This way, average valence and activation levels were determined for each cluster, for learner at t0, counsellor at t1 and learner at t2 (see figures 2 and 3 below). The data presented in figures 2 and 3 suggest several differences between the learner and the counsellor. First, there are differences in levels: counsellors’ emotional expressions (M= 4.46) are on average slightly higher in valence than those of the learner (M=4.22); the same can be said of emotional activation with a smaller difference between participants (valence: F(1, 3083) = 441.99, p = < .001; activation: F(1, 3083) = 14.19, p = < .001). Secondly, there is a notable difference in the extent of emotional fluctuations, subject to both activation and valence: while the counsellor’s emotions are stable, the learner’s emotions vary significantly. Differences in profiles (t0 and t1) can be represented as a negative correlation (r = -0.19). The higher the learner’s valence at t0, the lower the counsellor’s valence at t1 and vice versa. The same cannot be said with regards to the dimension of activation. 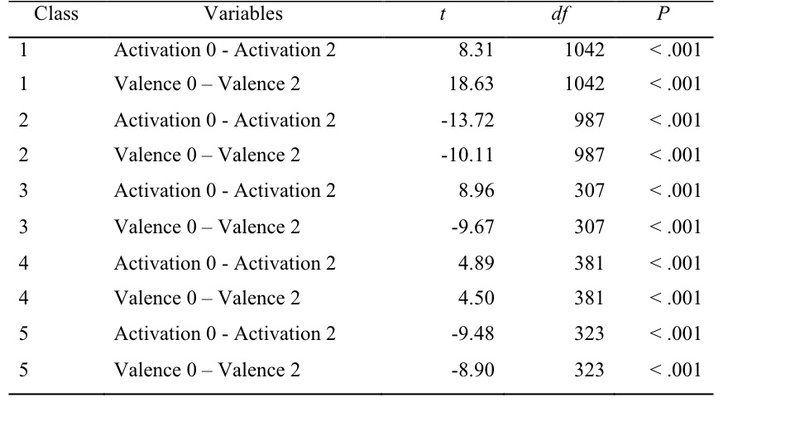 A comparison of average scores in activation and valence for the learner at t0 and t1 using a test of statistical inference (Student’s t-test) indicates significant differences (see Table 1). Learner differences observed at t0 and t1 cannot be explained by chance. If the valence increases from t0 to t1, it will also increase overall from t0 to t2. In other words, inter-individual differences between learner t0 and counsellor t1 can give rise to intra-individual differences within the learner (t0-t2). The differences between the learner’s activation at t0 and t2 rise at the same rate as the differences between the learner’s activation at t0 and counsellor’s activation at t1. The same applies to valence. The study aims to explain how emotional regulation may occur between a counsellor and a learner. When asked about the ambiance counsellors try to promote consciously in their interviews, they all think they try to be positive to motivate their learners. However, at an unconscious level (the level of emotional processes), they seem to ‘act’ differently. Changes between average profiles characterising classes appear to be negatively correlated between learner (t0) and counsellor (t1). When the learner’s valence and/or activation is low, the same variables for the counsellor tend to rise. Conversely, when the learner’s valence and/or activation is high, the levels of both tend to be low for the counsellor. This negative correlation between the learner and the counsellor cannot be interpreted as contagion, since the direction of change differs according to levels, in particular for the learner’s valence. There is no cumulative effect of increasing emotions. On the contrary, everything seems to happen as if the counsellor was trying to draw the fluctuating emotional state of the learner towards a more neutral position. The results of this study suggest that the counsellor unconsciously tries to regulate the learner’s emotions in an effort to construct a balanced emotional relationship (often qualified as homeostasis). This could be explained by the counsellor attempting to maintain the interaction with a neutral tone. It could be that the counsellor is influenced by the professional reserve expected of their social role. It can be assumed that these emotionally neutral periods are the most conducive for the completion of the tasks. The assumption is that when the learner’s emotional state deviates from a neutral zone, it prompts the counsellor to re-evaluate the interview and the learner’s activity. Through this study, it is possible to argue that the counsellor exerts a significant emotional influence over the learner, which can be described in terms of regulation. Inevitably, the study has a number of possible limitations. First, the results may not apply to other types of counselling situations. The diversity of learners and counsellors suggests an influence of emotional differential variables, which can be accounted for by the concept of emotional intelligence (i.e. the ability to detect emotional states in others and to express one’s own internal emotional state varies considerably between individuals). Other variables such as stress or personality also intervene in counselling sessions. More data needs to be investigated to check if these mechanisms can be commonly observed. A second difficulty in this study was the choice of turns as the units to process our data. We opted for the turn for the sake of convenience, but above all for lack of any more satisfying unit. This was problematic because turns do not match what we call ‘emotionemes’ (a term we have coined to define single units of emotion, characterized by a homogeneity of content and time span). Most turns are short, but some can cover several speech acts or refer to several topics that are likely to provoke different emotions in the learner and subsequently in the counsellor. In some rare cases, raters perceive different emotions in the same turn. The coding of one emotional tone per turn means that some information is overlooked. Conversely, an emotional state is often maintained in successive turns. The choice of the appropriate unit remains subject to debate, and should be decided in accordance with the objectives. Adopting the turn as the basic unit for a quantitative analysis is not entirely satisfactory since it does not distinguish overlapping and successive turns. A causal link may thus not apply to explain learner-counsellor relationships. Moreover, this type of analysis supposes that emotion has an impact as soon as it is perceptible from vocal expression, given that emotion can persist outside of any vocal trace and have a delayed impact. Finally, the practical implications of the research are still to be developed. The next step will be to examine how this model can help to predict evaluation of interviews by the persons involved and to determine how this evaluation affects the way learners put their decisions into practice. Emmanuelle Carette is a senior lecturer in applied linguistics at the Université de Lorraine, France (ATILF/Crapel). Her main research interests are teacher or counsellor/learner relationships (esp. emotional), self-directed learning, cultural differences in French Foreign Language teaching, L2 acquisition and aural comprehension. Eric Thiébaut is a senior lecturer in the INTERPSY research centre at the Université de Lorraine, France. He has published widely on the subject of individual differences. Guillaume Nassau is a Phd student at the Université de Lorraine (ATILF/Crapel). His research is focused on self-directed language learning environments. More specifically, he studies the role of the language learning counsellor, the emotional dynamics of counselling, and the gendered aspect of counselling sessions. Dewaele, J.-M. (2010). Emotions in multiple languages. London, UK: Palgrave. Ehrman, M. (2008). Personality and good language learners. In C. Griffiths (Ed. ), Lessons from good language learners (pp. 61–72). New York, NY: Cambridge University Press. Everit, B. (1977). Cluster analysis. London, UK: Heinemann. Frijda, N. H. (2003). Passions: L’émotion comme motivation [Passion: A relationship between emotion and motivation]. In J. M. Colletta & A. Tcherkassof (Eds. ), Les émotions: Cognition, langage et développement (pp. 15-32). Sprimont, Belgium: Maradaga. Frijda, N. H. (2004). Emotions and action. In A. S. R. Manstead, N. Frijda, & A. Fischer (Eds. ), Feelings and emotions: The Amsterdam symposium (pp. 158-173). New York, NY: Cambridge University Press. Hatfield, E., Cacioppo, J. T., & Rapson, R. L. (1994). Emotional contagion. New York, NY: Cambridge University Press. Lazarus, R. (1991). Emotion and adaptation. New York, NY: Oxford University Press. Martin, P. (2014). Emotions and prosodic structure. In F. Baiser & G. Cislaru (Eds. ), Linguistic approaches to emotions in context (pp. 215-229). Amsterdam, Netherlands: John Benjamins. Plemmons, S., & Weiss, H. (2013). Goals and affect. In E. A. Locke & G. P. Latham (Eds), New developments in goal setting and task performance (pp. 117-132). New York, NY: Routledge/Taylor & Francis. Scherer, K. R. (1989). Vocal correlates of emotion. In A. Manstead & H. Wagner (Eds. ), Handbook of psychophysiology: Emotion and social behaviour (pp. 165-197). Chichester, UK: Wiley. Scherer, K. R., Shorr, A., & Johnstone, T. (2001). Appraisal processes in emotion: Theory, methods, research. New York, NY: Oxford University Press. Following Holec’s (1981) definition as the ability to take charge of one’s own learning and assume responsibility for all decisions concerning all aspects of this learning.